Before starting to make my own Winamp plugins, I tried compiling an existing plugin DLL from source-code in my current setup, thus testing if my setup was working. I used the Beginner Basic Plugin Guide as a starting point for my solution in Visual Studio 2012. That seemed to work. I then compiled the resteless_dsp plugin, for which I found the source here: http://www.hartwork.org/doku.php?id=restless_winamp_plugin. This became problematic. And when I tried to run the configuration it told me ” Error loading module “. The problem boiled down to a wrong configuration (again) of Visual Studio. I was using Common Language support… Resolving this would imply installing extra software a the target PC and I didn’t want that. So I decided to go without CLR. 1> missing quotes ("") around 'RequestMinimum'? That eventually did the trick. The code compiles ok and it works fine on other windows systems. I hope this will help someone out there. Note that when you merely overwrite the dll with a newer version, the ” Error loading module ” error won’t go away. Use the “uninstall plug-in” button (right of the configure button) first to remove old versions of the plugin before adding the new version. Failing to do so will complicate debugging. 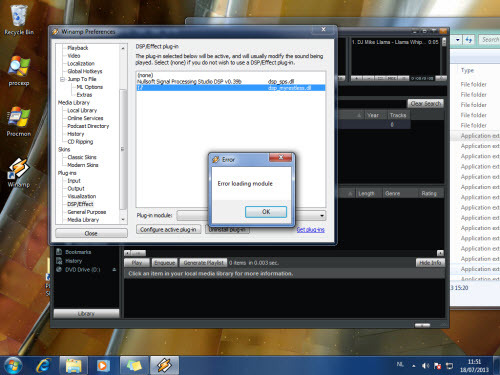 When you are learning the Beginner’s Basic Plugin tutorial, in order to create your first basic general plugin for Winamp, you might run into a compile error right away. What this error basically means is that MessageBoxW cannot be found. The function resides in user32.lib, and the Linker should know where to find it. As we created the project, Visual Studio 2012 did not add the dependencies for the linker (it left the field empty). The solution is to add these dependencies manually. Go to Configuration Properties -> Linker -> Input -> Additional Dependencies. This will in fact populate the field with all the dependencies (bunch of dll’s); You can see those if you go back to the settings again. Save the project and try again. Compiling should now run successfully. Bad Behavior has blocked 2051 access attempts in the last 7 days.